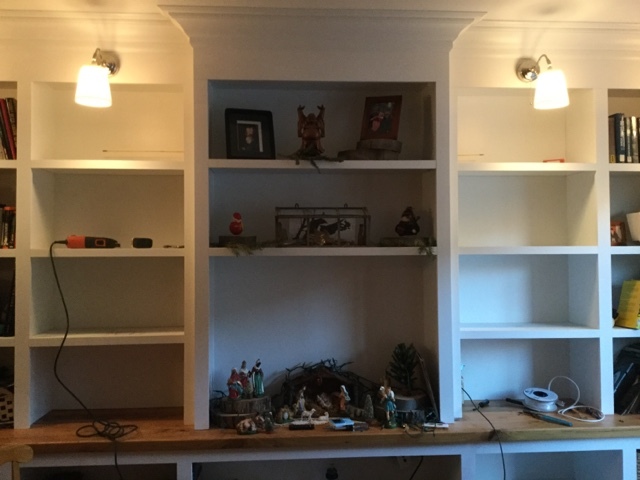 Almost two years into having this giant built-in, it's time to start thinking about maybe having some music in the house other than a jobsite jam box. I suppose I have been putting it off because I know that it won't be easy. One day (perhaps the day before I sell this place or hang the foreclosure sign out front), I will put some doors on this thing so I would like to put an audio receiver in one of the lower cabinets and hide it. Even though I built this thing in about a day and a half by myself, you will be surprised to know that I actually intentionally designed this thing for the upper cabinets to have the capacity to house vinyl lps, and the lower cabinets to house competent audio/video. It wasn't really because I knew that I, personally, would be able to indulge in leisure time. But rather, I was thinking of the next people who would live here. I have heard, through the grapevine, that some people engage in other activities besides endless work. 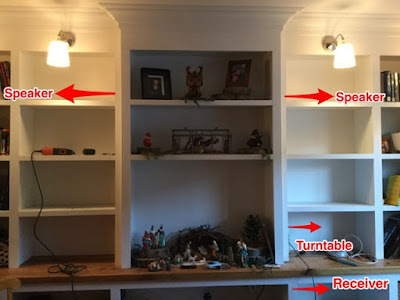 So here is the issue with a built in designed around a turntable use: I can hide the ugly component audio stuff in a lower cabinet, but I can't put a turntable in a lower cabinet because it's very hard to use. Turntables need a good amount of overhead clearance to load the records, move the stylus, flip the records, and view the track indexing. Thus, I always planned on having the turntable on the countertop portion of the built in, along with the collection of records. 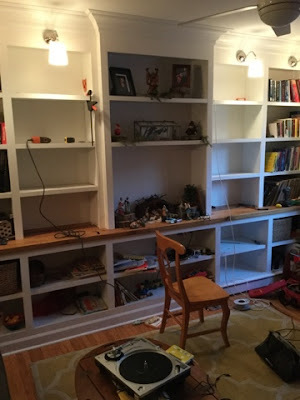 Unfortunately, due to a compulsive need to make the worlds tightest woodworking cuts known to all humankind, I scribed the 16' long, 23" wide, and 2" thick reclaimed red oak counter top around my existing chimney, and onto the back wall and the front wall of the house (not that anyone can even see, as it is obscured by the upper cabinets). 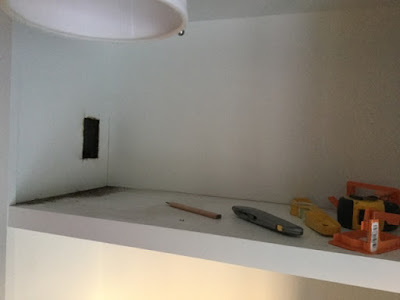 Thus, with air tight joints all around, there is no way to sneak any wires from the upper and lower cabinet. I do have one 1/2" hole with one piece of 12 AWG Romex cutting through behind the center upper, but it's not enough room to slip additional wires through. Also, it is bad practice due to electromagnetic field crossing to run conventional electric wires in parallel to low voltage wires due to interference. 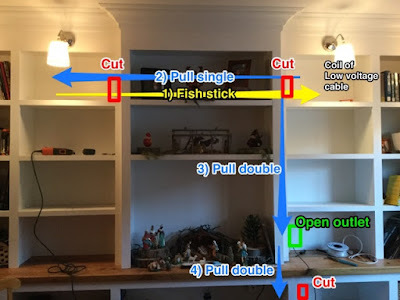 I want to fish these low voltage wires though the built in counter top discreetly, so I am going to pull one of the single gang recepticals next to the center upper cabinet, just above the counter. 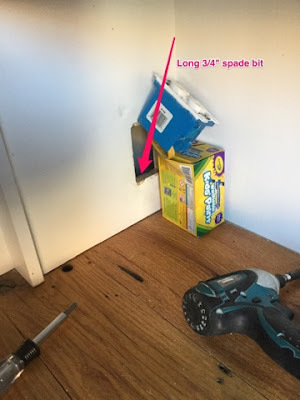 This gives me decent enough access to bore a 3/4" hole through the counter top secretly with a long spade bit. Unfortunately, one hour, two holes, three towers, and two spade bits later, I had a 13/16" hole in the counter, hidden from view. Wow, that sucked. It all seems so simple now that I just drew it up. Really, it was quite simple. But, it's slightly more complicated than it seems in theory, Fishing wires behind/inside something with no space behind it can be tough. 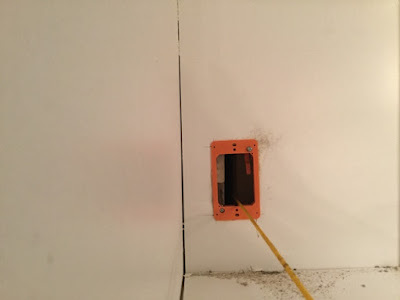 Combine that with also trying too power these components with conventional power from outlets, now you have more wires and more constraints on something with very little square footage that is able to have wall plates for power. Let's dig in. First, cut in two upper low voltage outlets and push fish stick through. White low voltage wire all pulled through according to plan. 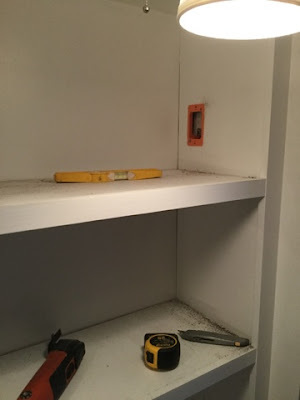 Next up: installing the electronics and punching one last hole in the counter top to connect all the dots. Stay tuned.